First off, let me clarify that I simply took the genre off Goodreads. Personally, I’d put a different genre there or at least at one word to it, but since that would spoil a lot of the book, I’m not doing that. My whole review was tricky to write because I really do not want to spoil anything so I’m going to give it my best shot! When I picked up this novel, I pretty much went in blind. It’d been a while since I read the synopsis and I quite liked the thought of not having any expectations. Of course, I somehow expected to get a cute-ish love story, but I got way more than that. 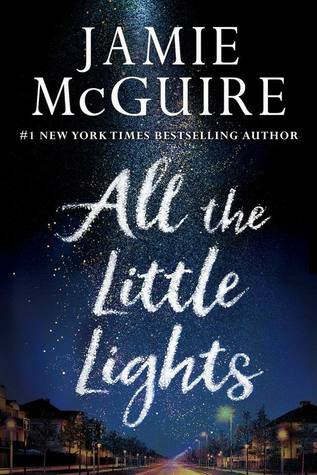 All the Little Lights is a novel where most people would keep guessing throughout what exactly is going on. Catherine, one of our main characters, has a secret she’s desperate to hide and even though we’re seeing things from her POV, she doesn’t let us know what it is. Which is exactly why a lot of people would be hooked, trying to figure out her secret – as did I, for some time. Since she’s trying to hide her secret for everyone, Catherine acts in a very peculiar way and although we can’t really understand why she’s doing it, I also felt myself connecting with her. She has a very hard time letting people in, afraid they might figure something out. Although her reason for that is different, I myself also have a hard time letting people in. And when someone comes along who just sneaks past your defenses, it’s a hard thing to accept. Her struggle to find a balance between her life at the Juniper – her home – and her newfound friendship with Elliott was nicely done, really. Elliott, Catherine’s childhood friend, is someone who has a lot of struggles of his own. During Summers he lives with his aunt, which is how he met Catherine. I loved the POC rep Jamie McGuire brought to this story with Elliott – who’s Cherokee – because it shows the clashing of different cultures and the influence racism can have on a lot of different aspects in life. I also really want to mention the minor mention of ASL! I live for those minority-mentions in books so I was pretty much squealing, dealing with a fluttering heart when I read that tiny detail in the book. He held up his hand, his index and pinky fingers pointing to the sky, his thumb out to the side. Unfortunately I got to the bottom of the whole plot way before I was meant to. I had a huge hunch of what was going on, what Catherine’s secret was very early on in the story. I think that might have to do with me watching a certain movie not all that long ago – I’m not going to mention which one because spoilers – and the signs were way too obvious for me. That’s also why I’m sure a lot of people might not experience this the same way as I did. You might be hooked and not figure it out until later on or until all pieces really come together. Another thing I was disappointed with is all the foreshadowing going on. A character thinking “oh, as long as that doesn’t happen…” and then x chapters later, there it is! I hate when that happens because it immediately feels spoiler-y and… if there’s one thing I hate, it’s getting spoiled, right?! Because of that the twists and turns that could’ve felt unique, really didn’t anymore. The foreshadowing combined with how quickly I figured out Catherine’s secret also made sure some chapters were just… well, not needed for me. They kept dragging on without going anywhere. Again, it might’ve just been because I’d figured it out already but… It might not? A third thing that grabbed my attention was how Catherine’s home – the Juniper – was meant to be creepy. Right from the bat, it’s obvious Catherine doesn’t like living there so I wished the creepiness would’ve been more pronounced. It definitely would’ve added another layer to this story for me. All in all I really liked the concept, and I realize I ruined it myself by having watched that certain movie so I’m sure others might enjoy All the Little Lights more than I did! I do believe I would’ve enjoyed it just that bit more should the creepiness have shone through a bit more though. When it comes to the munches, I had three options and… I was kind of ready to try them all but sometimes life gets in the way and that simply doesn’t happen. My options were a chicken enchilada casserole, a cheesy mac casserole and a hot dog with chili and loads of melted cheese. To be honest, my preference went to the chicken enchilada casserole but we ended up making the cheesy mac casserole. It was definitely yum enough, but I’m still hoping to try the enchilada one day, ha. Which of the three munches would you have gone for? If you pick up this novel, please let me know whether it was just me or maybe you also experienced this the same way! ‹ PreviousWRITING REVIEWS isn’t easy and we all know it! Next ›TTT: Where Kathy does her own thing.